Audi has created an experiential installation to showcase the brand's vision of the future. The spheres enable visitors to experience key aspects of Audi’s cutting edge technology: The Audi Ultra Sphere, explored the lightweight automotive construction of Audi vehicles; The Audi e-tron Sphere examined the future of electrical mobility; while the Audi Connect Sphere showcased the networking strategy for all Audi vehicles. 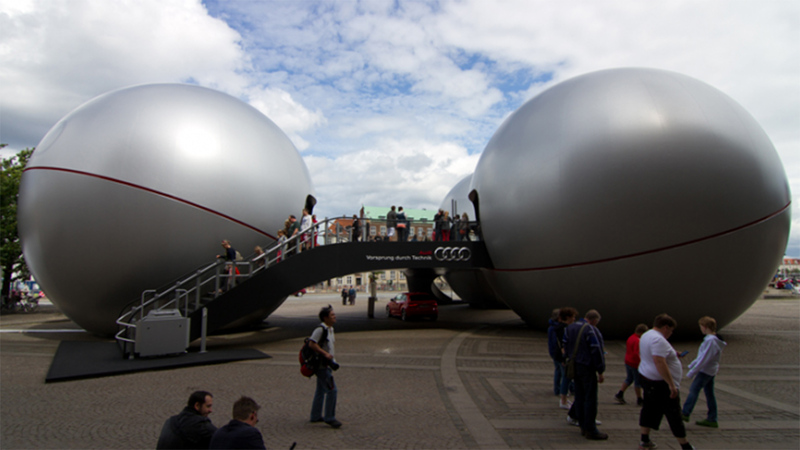 The spheres are filled with a range of interactive and futuristic technology with augmented reality video pads, giant video walls and interactive spherical displays. In the Connect Sphere, Visitors were invited to engage with the interactive videos which were projected onto the walls of the spheres, via a custom built sphere. 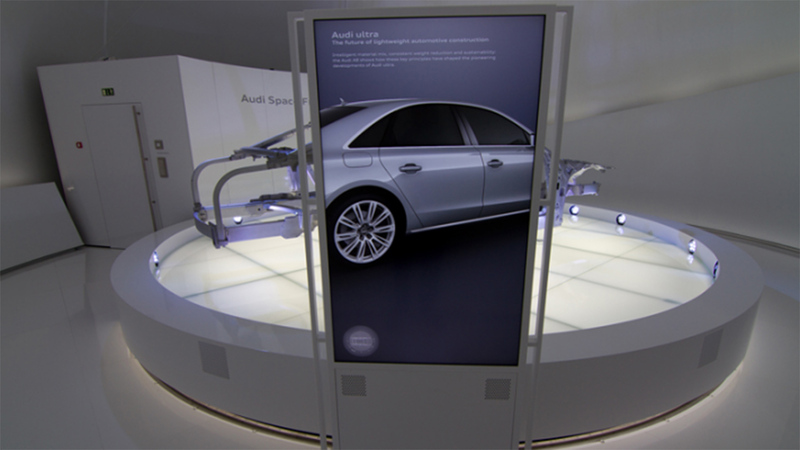 In the Ultra Sphere visitors could move a large scanner around the Audi frame to see what the vehicle would look like. 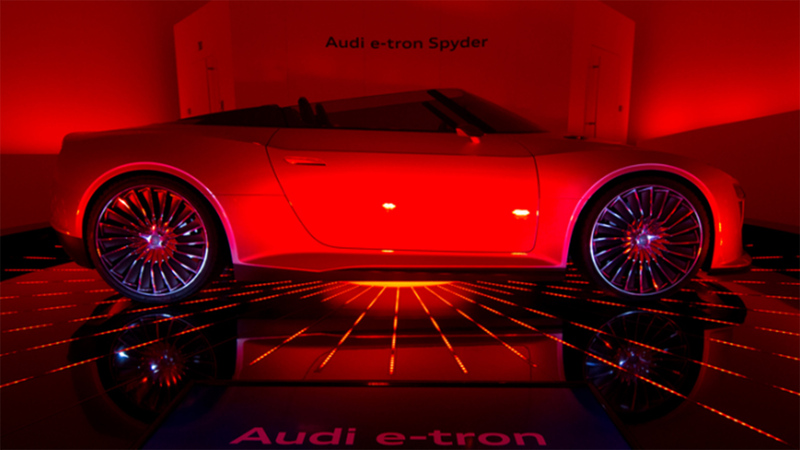 In the e-tron Sphere visitors could interact with win turbines to conceptually power the Audi car. 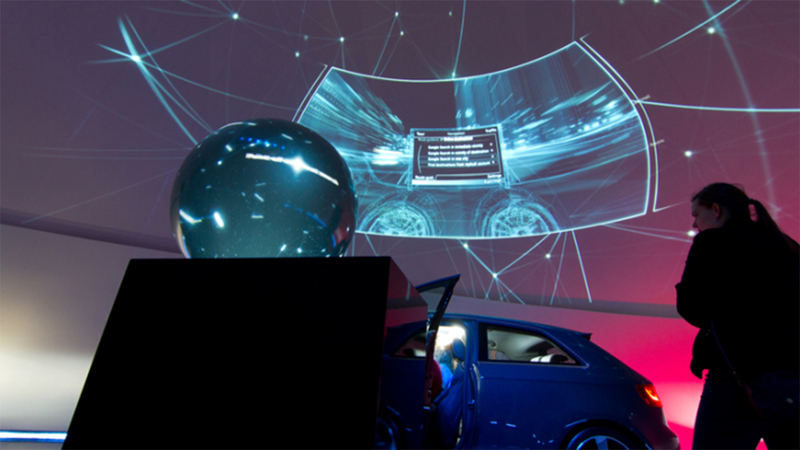 The spheres are an extension of Audi’s digital showroom concept, which will feature augmented reality and virtual test drives, and will roll out over the next few years. 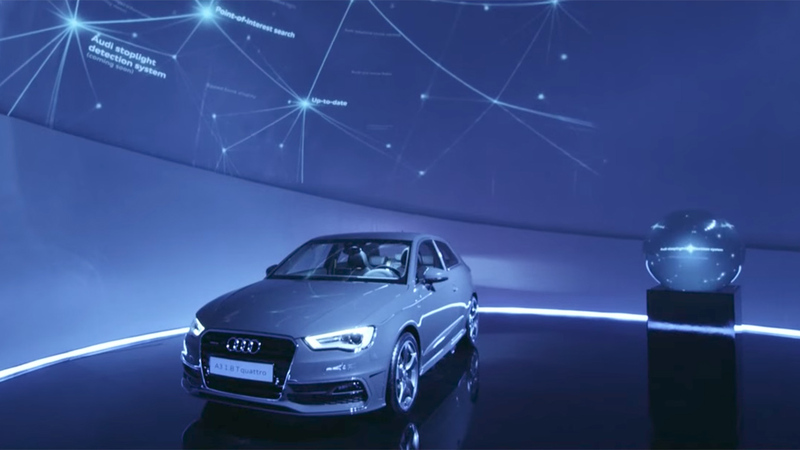 The Audi brand has one of the strongest brand slogans: Vorsprung durch Technik, which means “Advancement through Technology”, Audi Spheres brings that slogan to life through an immersive and engaging experience. The strategy here is clear, to demonstrate the technological advancements and superior systems in the Audi, while showcasing its green credentials in one of the greenest eco-concious cities in the world. 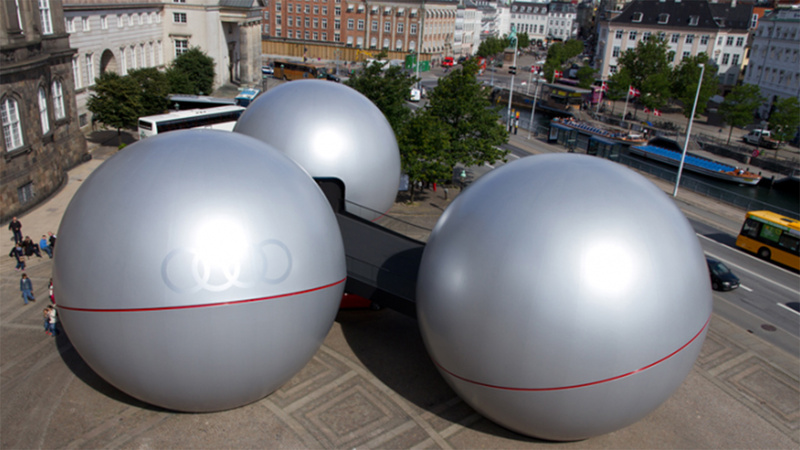 The installations really dial up the futuristic technological advancements in the car and by housing them in equally futuristic giant spheres the installations position Audi as ‘the future’ of the automotive industry. It’s a strong and powerful brand positioning and its reinforced by its location. 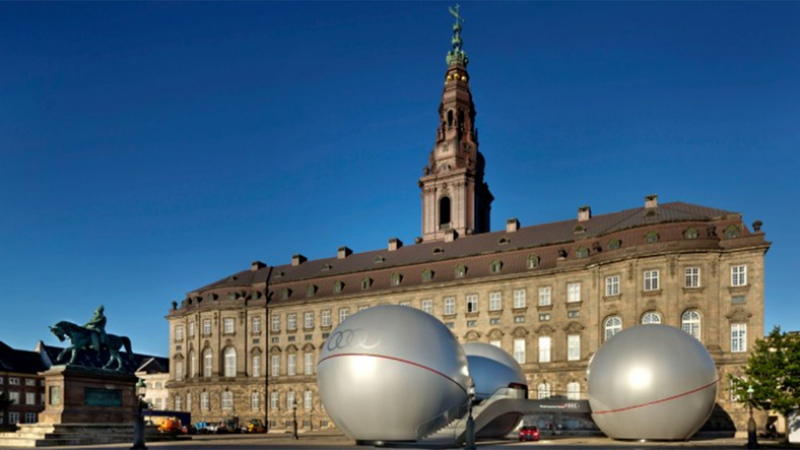 By housing this installation in front of the Danish Parliament, it sends a message to consumers that this is somehow governed by Parliament, that if the government is planning for the future of the country, Audi is too. This positioning is a great advantage in a marketplace full of similar looking car ads, featuring cars driving fast, turning corners etc. It also shares a genuine story with the growing eco-conscious consumer who is concerned about the future and their environmental impact. The strategy to roll this technology and some of the experience into its showrooms and really bring to life the technology in a digital showroom, is an excellent idea and one which will reap dividends for the brand by helping establish it as a leader in the category. For demonstrating its technological and ecological credentials, Audi has ticked some major boxes and proven it is a brand willing to push the boundaries. But sadly this strategy falls down when you go to the Audi website, which is full of car ads. Sure, they are beautiful car ads with strong artistic elements and lovely piano music, but they are car ads none the less. I even visited the Danish website to see if the experience extended online but it does not. I would have loved to go online and experience more of the Audi experience through some interactive elements, but sadly there was none. The storytelling and consumer experience that begins in the spheres is left in the spheres, which is a missed opportunity in my mind. Audi has created a brilliant immersive and interactive experience in Audi Spheres, so good it left me wanting more.